The standard title screen only has two major differences. 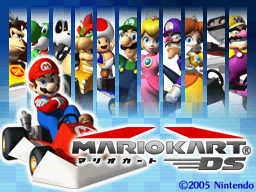 On the top screen, the Japanese title logo has "Mario Kart" in katakana to the left of the motion lines. 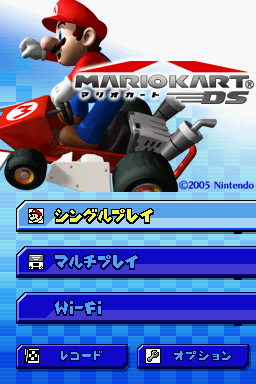 On the bottom screen, the "Nintendo WFC" option is simply called "Wi-Fi" in the Japanese version. R.O.B. (Robotic Operating Buddy) debuted as a controller for the NES in 1985. In Japan, his color scheme matched the white and red Famicom (Japan's version of the NES). To match the NES in America, he was colored light- and dark-gray. 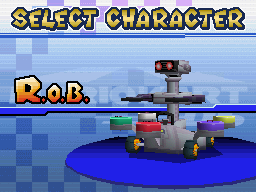 As seen in the following comparisons, the Mario Kart DS designers made sure R.O.B. had the correct colors for each region. R.O.B. 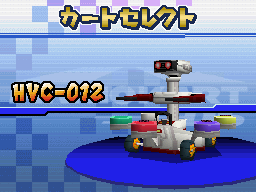 is called "Family Computer Robot" in Japan, but in the Japanese Mario Kart DS, he's named after his product ID: "HVC-012." 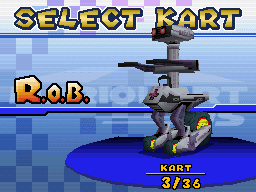 Seen above is the ROB-BLS kart, which is based on R.O.B. 's Stack-Up accessory. Seen below, R.O.B. finally gets a pair of legs when he drives the ROB-LGS. Even the alternate title screen has a darker-colored R.O.B. for America. The enemies, hazards, and bosses that were named in the Mission mode are listed below. Big Bully and Chief Chilly: Donketsu means "lowest rank." Cheep Cheep: "Pukupuku" is derived from bukubuku (bubbling sound). King Boo: "Teresa" comes from the Japanese verb tereru, which means "to be shy." Blooper: "Gessō" is from geso (squid tentacles). Boo: "Teresa" comes from the Japanese verb tereru, which means "to be shy." The abbreviations for some "Standard" karts changed along with the character names: KO (Kinopio) to TD (Toad); KP (Koopa) to BW (Bowser); KA (Karon) to DB (Dry Bones). Poltergust 4000: "Obakyūmu" is a play on words, combining obake (ghost) and bakyūmu (vacuum). In Luigi's Mansion, "Obakyūmu" is the Poltergust 3000. R.O.B. 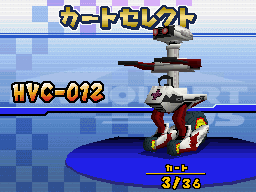 karts: HVC-BLS is the product code for the Japanese version of Stack-Up (Family Computer Robot: Block Set). 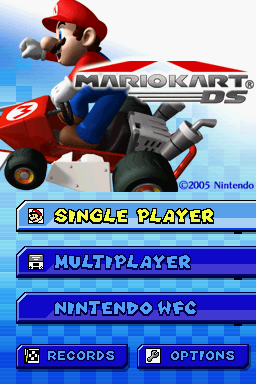 HVC-LGS appears to be a new creation for Mario Kart DS. Airship Fortress: Bullet Bill is called "Killer" in Japan, hence the name "Killer Ship" in the Japanese game. Delfino Square: "Monte" is the Japanese name for Piantas. N64 Banshee Boardwalk: Hyūdoro is a ghost noise (the word hyūhyū represents the sound wind makes). In the Retro Grand Prix courses, SFC stands for "Super Famicom," the Japanese name for the Super NES.